Für die brasilianische Zeitschrift »A Tribuna« schreibe ich eine Serie über das neue Paradigma der Weltzivilisation. Vor ein paar Tagen ist der erste Teil davon auf Portugiesisch erschienen. Die Textserie soll eine Reihe von Konferenzen zu diesem Thema vorbereiten, für dich ich dann, wenn alles klappt, im November nach Brasilien fliege. Ich schreibe die Texte auf Englisch und lasse sie dann ins Spanische und Portugiesische übersetzen. Hier ist die englische Fassung. Die spanische ist bislang unveröffentlicht. We cannot go on as we did. To proceed with »business as usual« now would be deadly for all of us, for all of mankind as well as for the biotop we inhabit. 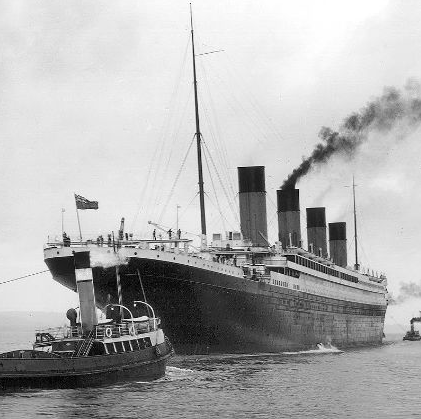 The Titanic is steering at high speed towards the iceberg, but we are still dancing, the orchestra plays on as if we could not do anything about it. Can we? The world needs a new paradigm. I say this, Daniel Pinchbeck says it, whose book »How soon is now« I just translated into German. Thousands of scientists and wise people say it as well as artists, religious leaders and nameless simple people to whom nobody is listening. Deep down in our hearts, we know that we human beings on earth cannot go on like this. We cannot go on destroying our virgin forests, depleting and soiling the oceans, polluting the air, exploiting the people, helping the rich getting richer while the poor are getting poorer in an economy which produces a wide array of harmfull and unnecessary goods instead of feeding the hungry – and does this in a frenzy. To use a concept from IT: We need to set up a completely new operation system on earth. We cannot put up with new apps on the same old operation system, we need a completely new system to organize our human civilisation. It is a question of life or death. If we don’t do it, the Titanic will crash into the iceberg and sink. And we will have less survivors than the Titanic had, because an atomic war will kill us all, rich and poor, wise and stupid alike. And so will an eco-disaster which destroys the very biotop we live on, which has nurtured our species since our primate ancestor stepped down from the trees and learned to walk upright, using tools, using language to communicate and then walking out of Africa some 60.000 years ago – in that way we are all Africans, and most of us, Brazilians and others, expats. We need to manage the turnaround especially for our children and grandchildren. Even if we who read this text now should succeed in keeping up our present way of life a few years longer, our progeny will not. If we love them and their children and the plants and animals around us and the natural beauty which civilisation has left, we should change now. Here are some suggestions what and how we should change. • Be more selective concerning the sources of your information. • Be less biased – humantity is our tribe, not a part of it. • Look into whom you identify with, look into who you are. • Love more, fight less. • Eat less animals or none at all. • Travel less, especially less by air. Avoid individual trips by car. Walk or bike, that is also better for your health. • Take care of your physical and mental health. • Understand that we are all connected. Ecology studies the connectedness of living nature; systemic psychology the connectedness of our souls. • Be passionate, but in a relaxed way. The transformation is urgent, but it will not happen overnight. • Understand yourself as a figure in a cosmic play. Be aware, that you are onstage, always. Take it with humour, as a comedy. As individuals we will soon die anyway. • Support the politicians who are aware of the need of this transformation. Join people who are aware of it, connect with them. • Use the internet in an intelligent way. Be wise, be selective. • Be good to yourself and the people near you. Then widen this radius of empathy as far as you comfortably can. Das sind weise Dinge, sicher. Etwa: “ Be good to yourself and the people near you. Then widen this radius of empathy as far as you comfortably can“. Meine Frage wäre jetzt aber – und das ist nicht zynisch gemeint: Was bewirkt es? Insgesamt? Es gilt noch immer die Regel, daß 10-15% diesen Beispielen folgen sollten, damit etwas ins Rollen kommt. Es ist gut, mit positivem Beispiel voranzugehen. Allein schon, weil man es für richtig hält, es so zu halten. Aber Deine Motivation, diese „Gebote“ zu benennen, war ja eine andere: Nämlich etwas zu bewirken. 10-15%, die dem folgen (nicht weil ich es es gesagt habe, sondern weil es an der Zeit ist), das wäre mega viel. Ich glaube, dass vorerst schon viel weniger genügt. Dann können sich die neuen Verhaltensweisen von dort aus verbreiten – exponentiell, wie eine Seuche ;-). Ich verstehe Dich: Du bist ein Optimist. Das ist optimal in unserer heutigen Zeit. Aus der Primatenforschung weiß man seit kurzem, daß, wenn ein neues Tier in die Gruppe kommt, Verhaltensweisen Änderung erfahren können, etwa die Körperhaltung beim Fischen oder die Art der Verwendung eines Werkzeugs. Die Gruppe benutzt eine bestimmte Verhaltensweise durchgehend (man macht das so!). Plötzlich aber lernt man eine neue Verhaltensweise, adaptiert sie. Aber als wissenschaftlich interessierter Laie – wobei ich weiß, daß Wissenschaft in bestimmten Kreisen verteufelt wird – musste ich das mal anbringen. Womit ich wieder den Bogen zu Deinem Optimismus schlage :-).